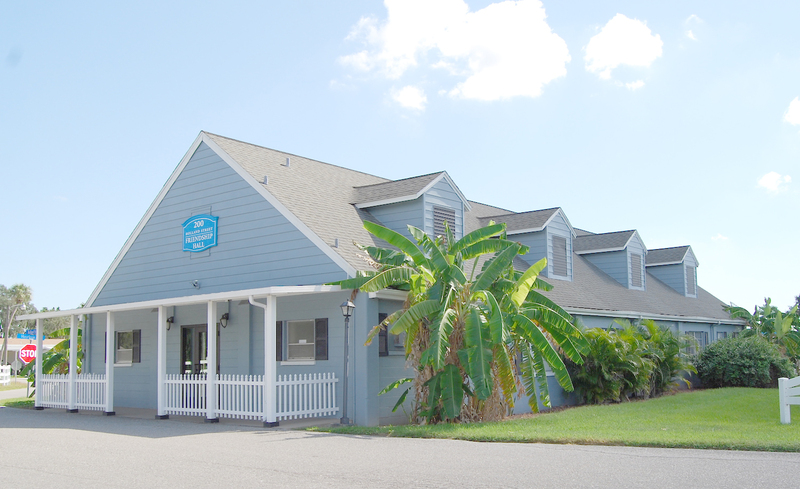 Equity LifeStyle Properties owns and manages Colony Cove mobile home park in Ellenton. 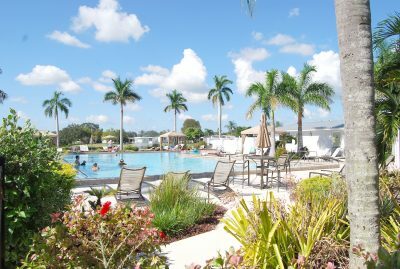 With 2,211 lots and 2,207 homes on 526 acres, five heated pools, tennis and pickle ball courts, 27 miles of roads, and 37 fire hydrants sprawling across U.S. 301 in Ellenton, Colony Cove may be the largest mobile home park in Florida — and possibly in the nation — according to Candy Candrilli, president of the Colony Cove Homeowners Association. But even with its expansive size, Colony Cove has the feel of a small neighborhood community. Along with five clubhouses and all the amenities, the mobile home park’s social calendar was packed with activities for its 55-year-old-plus residents. “The nicest thing about Colony Cove is all the activities,” said Candrilli, who came by his first name, Candy, during military service when no one could pronounce his last name. “If you’re bored then shame on you,” he said. On the October calendar alone there are more than 300 activities and club meetings listed, starting from 8 a.m. until after 7 p.m., and all of the winter residents and renters from up North have yet to arrive. Much of the community activity in Colony Cove has centered around the five clubhouses dispersed throughout the park. Most of the organized clubs meet at these clubhouses, each unique in design and varied in size. There are five swimming pools next to the clubhouses at the Colony Cove mobile home park. There are clubs for residents from various areas of the country to get together for socials and talk about their former home states, and many clubs are centered around a specific hobby as the focus, such as orchids, quilting, or art. Park residents also meet at the clubhouses for bridge, euchre, poker and other card games. And there are the bingo game nights. If a resident is interested in sports, there are leagues for golf, bowling, shuffleboard — and the new rage — pickle ball. Colony Cove residents can sign up for several cruises organized throughout the year, or motor coach trips to interesting spots around Florida. And if you do not have a car or do not drive there is the free shuttle bus to take you places such as shopping, or the beach, or even to the casino. Equity LifeStyle Properties, which owns and manages Colony Cove, provides the free bus shuttle service, along with a list of other amenities, which makes the mobile home park a great place to live. 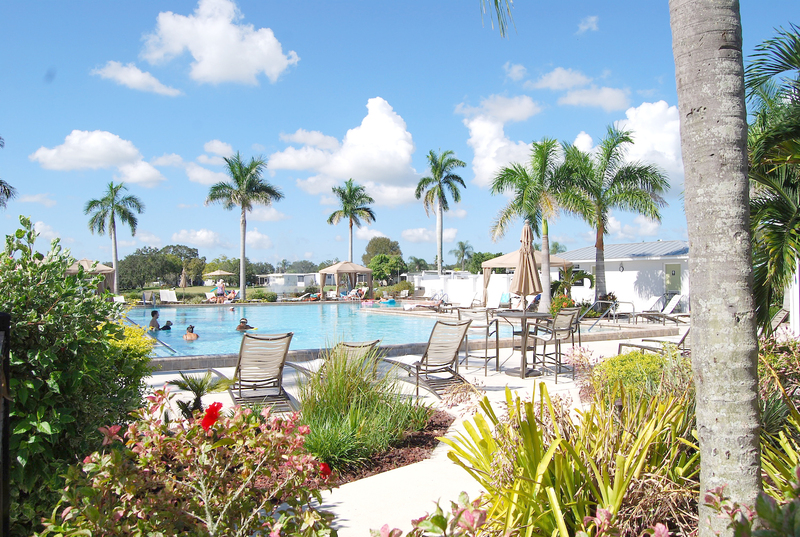 There are heated pools next to each of the clubhouses, a patio pavilion where residents and guests can hold events, a picnic area, a dog park, tennis, shuffleboard, and pickle ball courts, a marina, libraries maintained by the residents at some of the clubhouses, and a community garden, along with several other services and features Equity LifeStyle offers. 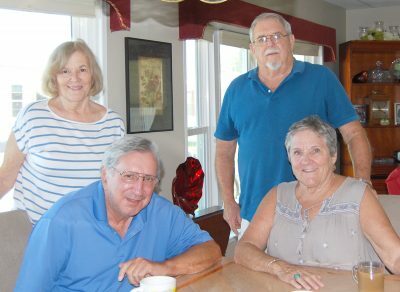 Lynne Rivet, standing left, and Bill Dow have been friends with Candy and Ann Candrilli for years in Cape Cod, Mass., before they all moved to Colony Cove. And to keep the residents up with all that is happening at Colony Cove, there is a monthly newspaper called Colony Cove Breeze. Colony Cove started as a church campground in 1955 when the Lawrence Brunk family moved to Palmetto from Virginia and purchased the property. They built a church, a cottage for the family living quarters, and dormitories. The abandoned church still stands at the corner of U.S. 301 and Amsterdam Road on property waiting to be developed. The Brunks expanded the campgrounds with a recreational vehicle park and eventually the property was sold and developed into a mobile home park. Over the following years the mobile home park, known to the residents as the West area, expanded east, called the South area, then crossed U.S. 301 to include the North area, and north again to the Lake area. The park continues to grow with 53 more lots being developed on the west side of Victory Road. Candrilli became president of the HOA in January, after serving on the board of directors for five years. The retired mainframe computer programmer moved to Colony Cove from Cape Cod, Mass., with his wife Ann in 2008. But Ann had previously purchased a single-wide mobile home in Colony Cove in 2002 with a friend, Lynne Rivet. “I just retired as business manager of a water distributor in Bourne, (Mass. ),” Ann said last month during in an interview in their beautifully decorated double-side mobile home. “(Candy and I) talked about what to do when we both retire, and he said he definitely wanted to go to Florida,” she said. The former dormitory of the original Victory Campgrounds, developed by the Lawrence Brunk family as church campgrounds, is now one of the five clubhouses at Colony Cove, named Friendship Hall. Rivet, who was in real estate in Cape Code, has known the Candrillis for years, she said. When she “saw the mobile home, and saw the community, and that there was so much to do here” she said she decided to buy the mobile home with Ann. Another friend who grew up in Hyannis Port on Cape Cod, Bill Dow, moved to Colony Cove after visiting the Candrillis. He has lived in Colony Cove for about seven years. “I’m impressed by all the social activities,” Dow said. Becoming involved in social events helped the Candrillis, Rivet, and Dow to get to know their neighbors. The close-knit community atmosphere may be the best part of living in Colony Cove. “We have a friend who lives in a condo in Bradenton, and it could be months where she doesn’t talk to her neighbors,” said Ann. “Here it’s a community. “Everyone knows each other and talks to each other all the time,” she said. “And we watch out for each other. “That’s what I love about Colony Cove,” she added. But even with the small-town feel, the residents have opportunities for big-city experiences at the park. The homeowner’s association sponsors one of the major events at Colony Cove, the Parade of Stars, every month from November to April, Candy said. These are star-studded nights of entertainment where comedians, singers, and musicians, who have performed in places such as Branson, Mo., and Las Vegas, come to Colony Cove. The Harmony Hall Hobby Club at Colony Cove are making and selling bracelets for $5 with the insignia of all the Armed Services to raise money for a veterans’ memorial at the mobile home park. Equity LifeStyle Properties also has organized events for Memorial Day and Fourth of July every year. Many of the Colony Cove clubs are active providing services to the community outside of the park. Ann belongs to the South Hobby and Service Club, which meets at one of the clubhouses near her home in the South area. The members raise money for cancer prevention and service groups by making and selling bracelets, mostly of crystal, and anklet jewelry. The 301 Cruisers, a club of golf cart enthusiasts, has held a spaghetti dinner to raise money and collected toys for the U.S. Marine program “Toys for Tots” every year. Other park groups have raised funds for park projects. “A group of women are trying to raise money to build a memorial for service veterans here at Colony Cove,” said Candy, a U.S. Air Force veteran. 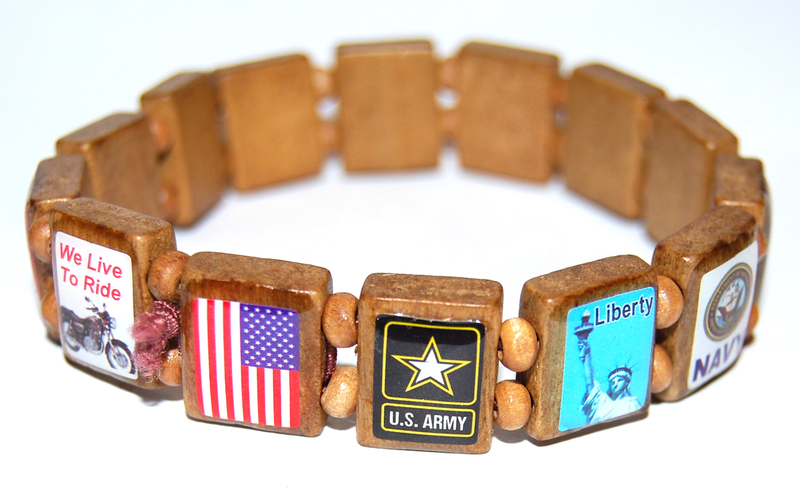 “The Harmony Hall Hobby Club makes and sells bracelets (with insignias of all the armed forces) for $5. Ann summed it up about what makes Colony Cove so special. “It’s the friendliest place I’ve ever lived,” she said. For more information on the Colony Cove Homeowners Association and history of the mobile home park, visit its website at www.hoacc.org. To learn more about Equity LifeStyle Properties, visit their Colony Cove sales office, at 101 Amsterdam Ave., Ellenton, or go to its website at www.mymhcommunity.com.